Dear Vegalicious Readers, this is a delicious soup we recently found at the “Daily Green” blog. 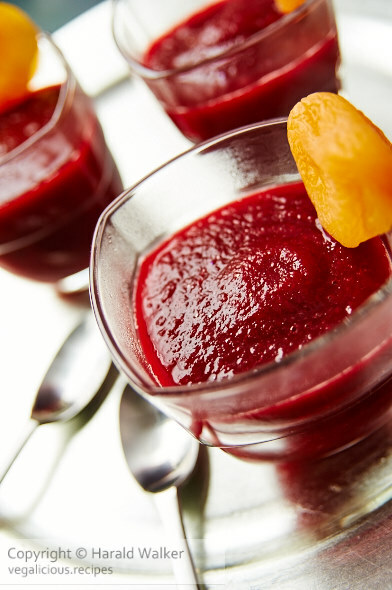 It has the earthy flavors of beets, with the mild sweetness of apricots and orange juice. Perked up with the flavors of onions, garlic and cumin. Altogether, this flavor packed soup that is really tasty. It can also be halved for a smaller amount. We do hope you give it a try and enjoy it as much as we did. Note: We are sorry but the recipe doesn’t seem to be available any longer. Posted by Chris Walker on March 5, 2010 in Apricot, Beet, Meals, Reviews.